If you’ve been house hunting, then you may have seen a listing or two that includes dual master suites. Although they are by no means common, more and more homes are featuring dual master suites – especially new luxury construction. But just what are dual master suites? And, more importantly, would dual master suites be right for you and your family? What are dual master suites? When you see dual master suites in a listing, it means the home has two master bedrooms each with an en suite bathroom. Dual master suites often feature walk-in closets, luxurious bathrooms with separate showers and tubs, and spacious floor plans with sitting areas. They can be used for a variety of reasons. Some spouses prefer to sleep separately, or to maintain their own private spaces. They can also be used as guest bedrooms, playrooms, home theaters, home offices, or entertaining spaces. Having a separate space for an elderly parent. Many households today are becoming multi-generational, with adult children caring for an aging family member. Having a second master suite gives the parent their own space but makes it easy to give them the extra care they need. Buying a home with a friend. More and more people are finding that it’s cost effective to share in the purchase of a home. Having dual master suites makes home ownership more practical for friends or family members who would like to buy a home jointly. Getting a better night’s sleep. Let’s face it – sometimes it’s just impossible to sleep if the person next to you is snoring. Or your sleep could be easily disrupted if you keep different schedules and sleep at different times. In these cases, having dual master suites makes it easier to get a better night’s sleep – and saves someone from having to sleep on the couch. Designing a more personal space. It’s rare that two people have exactly the same taste. With dual master suites, each person gets to design their own living space. This can be especially helpful if one person needs abundant natural light while the other prefers a dark bedroom. A higher price tag. 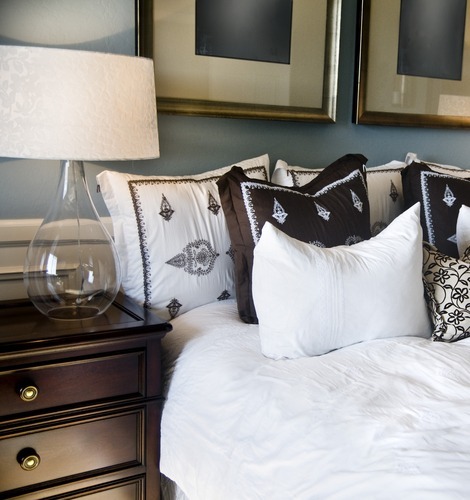 Having two master bedrooms and bathrooms mean homes with more square footage. More space means more money – especially when that space includes a luxury bathroom. A much larger home. When your home features two master suites, each of those rooms will take up a considerable amount of space. This can be problematic in homes that are smaller than 3500 square feet. If you’re hoping to renovate a smaller home so that it has two master suites, this may not be possible unless you significantly reduce the size of other rooms. To really enjoy the full dual master suite experience, it’s easier to start from scratch and build a new home or to purchase a home that already has them.